Veteran sleuth of the secretive Bilderberg meetings, Jim Tucker, has passed away at age 78. He is survived by his continuing work. James P. Tucker, Jr. (12/31/1934 – 4/26/2013) worked for the American Free Press, who broke the news of his death. Prior to that he had worked for The Spotlight. In 1954, some 100 industrialists, top geo-politicians, European royalty and monopolists began meeting under the radar to more closely mold the world in their image. Founded by Prince Bernhard of the Netherlands, the group, without a name, took that of their first meeting place: Hotel de Bilderberg in Oosterbeek, Netherlands. The group would remain a powerful embryo growing into world government, with strong insider players controlling the development of and profiting from the emerging system. Jim Tucker, an experienced reporter working in Washington, D.C., was shocked to learn about the group, as he had never heard them mentioned in the newswires he so closely followed. In 1975, he began tracking Bilderberg, and by about 1980 he was physically shadowing them at their annual meetings, which move to a new, undisclosed location each year. For many years to come, Tucker remained a lone voice in exposing the momentous efforts to establish a global collective for the benefit of a tiny elite who steer its reigns. However, later years would bring new change, as the European Union unfolded and meetings like the G20 attempted to bind the regions of the world through financial and political compacts. These events only confirmed the importance and foresight of Tucker’s work. A new wave of activists learned about the quiet group shaping the world and have now created a fervor around Bilderberg reporting in defense of sovereignty. Whereas before the elitist cell managed to escape the media spotlight, it was now faced with reports and coverage every year. As time wore on, investigative reporters and alternative media outlets, bolstered by the Internet, joined his ranks. Tucker went on to explain how the elitists were confronted by a throng of reporters that year as a result of the activism of his readers, leading to unwanted media coverage of their efforts, and a subsequent avalanche of interest in their activities. Since the time of that 1994 Helsinki meeting, interest has piqued about the agenda of Bilderberg. Tucker said that every year since that pivotal meeting, his paper’s circulation department sent a letter to subscribers near upcoming meetings urging them to contact their local media and demand coverage. 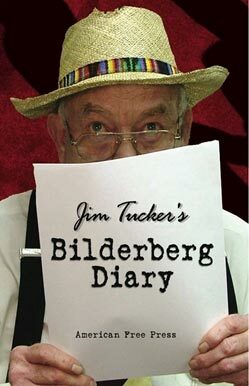 Jim Tucker will be missed, but his memoir, the Bilderberg Diary, published in 2005, puts his work on the record. It includes the locations and dates of the meetings, and significantly, the roster of its notable attendees. Tucker’s legacy is reflected in the widespread awareness and critique of a group that was once so obscure as to fall completely through the cracks of the news cycle and to be unrecognizable to any in the public that heard its name. Year after year, he stole from the gods the names of their members (both literally and metaphorically). Their titles, important positions and tremendous influence are now known and listed for study. What we do with it, whether we hold those individuals accountable and expose their insidious agenda, is up to us, the generations still fighting for freedom. Last year’s 2012 Bilderberg meeting was held in the United States in Chantilly, Virginia outside Washington, D.C. It would be Jim Tucker’s last stand against the group he had dedicated his life to uncovering. With him were in total more than a thousand protesters outside the walls of the hotel where black limos entered to make decisions in private that affect the public interest. In that sense, he would go out in a blaze of glory, with his work carried on in thousands of boisterous voices both young and old. Never Forget: 9/11 Plane Part Suddenly Found in NY? Is Genetic Modification Modifying Us?